So pretty! Perfect colors for this still-chilly, yet almost-spring weather! That is beautiful - it looks super cushy! And what great memories knit into it! I love it! Such pretty colors, it looks so soft! It's awesome and beautiful. Just like you and Elisa. What a great looking scarf! And such a nice post too. 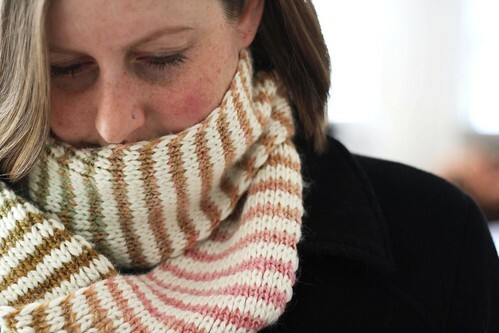 I am beyond thrilled that you were able to find such a great use for my handspun. It is such a pretty pretty scarf, and I feel totally honored to share space with Brooks Farm yarn, cuz, wow - that's the good stuff. I've seen so many of these scarves, but they're always done in dark colors. Yours is the first one in light colors. I love it! It's a completely different effect. Looks so cozy. 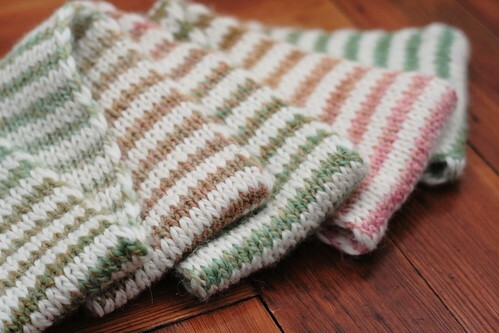 What a great way to get the most mileage out of handspun and the the light contrast yarn really showcases it. Beautiful! Beautiful scarf and awesome photo of you! Isn't Elisa great? That is a lovely combination. Perfect for Boston weather like today. Congrats on a great piece. Great story! And what a lovely scarf. So pretty! Elisa is just so fantastic, isn't she? Beautiful scarf and lovely sentiment too. I love it! That's a great idea for using handspun - it really shows off the colors. Gorgeous! What a beautiful scarf. Beautiful scarf and I love the sentiment behind it! 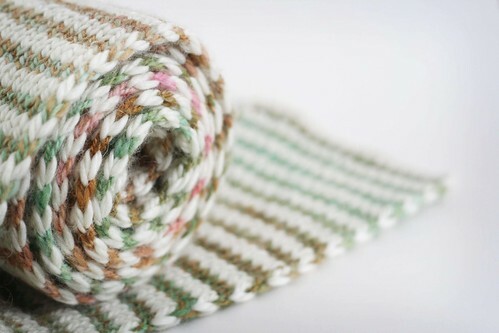 Beautiful scarf -- what a great way to bring out the colors in the handspun yarn. I love making these scarves but I think yours is the most attractive I've seen so far.